Rabbi Erica Asch has not followed a traditional path to becoming a rabbi. The daughter of a mixed marriage – her father is not Jewish – she grew up as one of a handful of Jewish kids in the Navy town of Coronado, California. Being part such a small minority intensified her sense of Jewish identity, which she cultivated further as a student at Oberlin College. After graduation, she joined Teach For America and taught high school math in the Mississippi Delta, where she discovered her life’s vocation — she realized that she wanted to spend her life teaching Judaism rather than algebra. 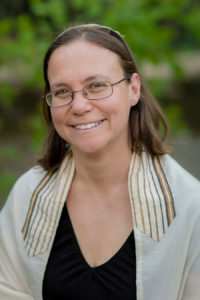 She enrolled at Hebrew Union College-Jewish Institute of Religion in Cincinnati and received her rabbinic ordination in 2008. She then took a position as a community organizer with the Industrial Areas Foundation, the first rabbi to do so directly out of rabbinical school. After three years with IAF, she served as an assistant rabbi at Temple Sinai in Washington, D.C., before moving to Augusta, Maine in June 2013. In Augusta, Rabbi Asch has been instrumental in the creation of the local interfaith group, the Capital Area Multifaith Association. Rabbi Asch is active in the community and has most recently been working with the Capital Area New Mainers Project, a group of volunteers who welcomes immigrants and refugees to the Capital Area. Rabbi Asch serves on the Urgency of Now Strategy Team for the Religious Action Center of the Union for Reform Judaism is on the board of the Central Conference of American Rabbis. She also serves as Jewish Chaplain at Colby College in Hillel and is the Assistant Director for the Center for Small Town Jewish Life. Rabbi Asch is passionate about community organizing–building power across lines of race, class and faith to make change on a local and state level. When not working she enjoys hiking and being outdoors, cooking, and reading. She lives in Hallowell, Maine with her husband, Chris Myers Asch and their three children, Miriam (9), Robin (7) and Aaron (5), as well as a cat (Thunder) and a dog (P.T. ).